Mold can affect the health of people who are exposed to it. 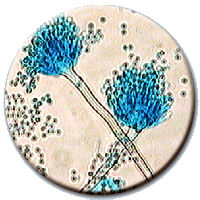 People are mainly exposed to mold by breathing spores or other tiny fragments. People can also be exposed through skin contact with mold contaminants (for example, by touching moldy surfaces) and by swallowing it. The type and severity of health effects that mold may produce are usually difficult to predict. The risks can vary greatly from one location to another, over time, and from person to person. 2. Begin Drying All Wet Materials - as soon as possible, begin drying any materials that are wet. For severe moisture problems, use fans and dehumidifiers and move wet items away from walls and off floors. Check with equipment rental companies or restoration firms to see if you can rent fans and dehumidifiers. 3. Remove and Dispose of Mold Contaminated Materials - items which have absorbed moisture (porous materials) and which have mold growing on them need to be removed, bagged and thrown out. Such materials may include sheet rock, insulation, plaster, carpet/carpet pad, ceiling tiles, wood products (other than solid wood), and paper products. Likewise, any such porous materials that have contacted sewage should also be bagged and thrown away. Non-porous materials with surface mold growth may be saved if they are cleaned well and kept dry. 4. Clean Surfaces - surface mold growing on non-porous materials such as hard plastic, concrete, glass, metal, and solid wood can usually be cleaned. Cleaning must remove and capture the mold contamination, because dead spores and mold particles still cause health problems if they are left in place. 5. Disinfect Surfaces - after cleaning has removed all visible mold and other soiling from contaminated surfaces, a disinfectant may be used to kill mold missed by the cleaning. In the case of sewage contamination, disinfection must be performed. Contact your home inspector for advice. 6. 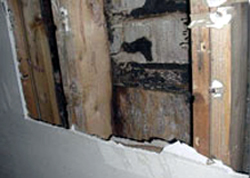 Remain on Mold Alert - Continue looking for signs of moisture problems or return of mold growth. Be particularly alert to moisture in areas of past growth. If mold returns, repeat cleaning steps and consider using a stronger solution to disinfect the area again. Regrowth may signal that the material should be removed or that moisture is not yet controlled.